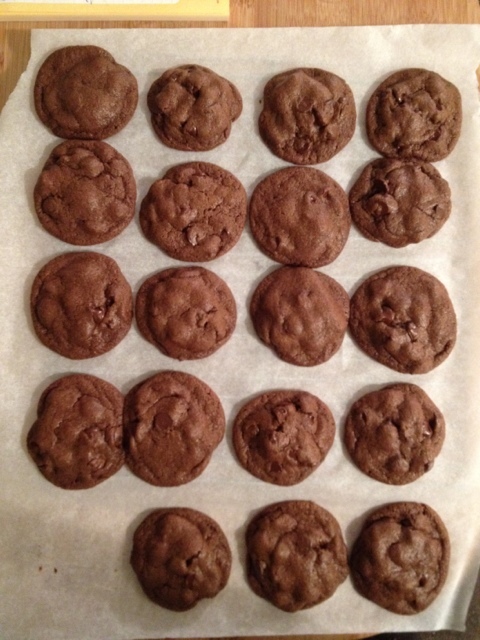 May I suggest double chocolate peanut butter cookies as a good way to end your weekend? November 13, 2011. Make it again. 1 comment. Professor Jordan emailed me this recipe as a challenge and it turned out to be quite easy to put together. Especially because I was able to pick up everything at the Vietnamese grocery store on 38 in New Jersey. I figured we’d need a little more for dinner, so I threw together some chickpea burgers as well. The spread! Table and fancy serving ware provided by Mir and Jacob. On the left hand side we have pickles from the Rittenhouse Square farmers’ market, as well as lettuce and tomato for the chickpea burgers. 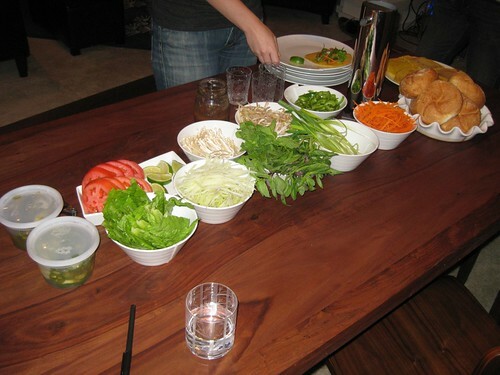 Then, fixings for the Vietnamese pancakes – lime and shredded papaya (you can buy it preshredded at the Vietnamese grocery store? ), enoki mushrooms and basil/mint, bean sprouts and green onions, green pepper and carrot (shredded using my Japanese mandolin of DANGER), rolls and pancakes themselves. 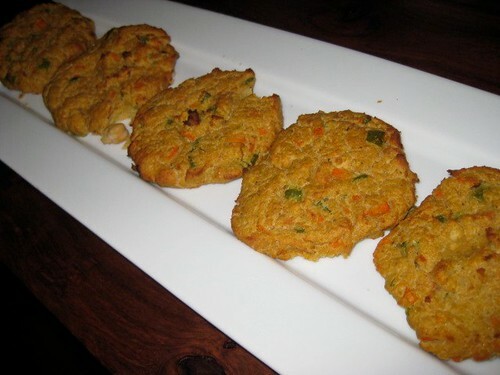 I made the chickpea burgers by sauteing carrot and pepper in coconut oil, processed chickpeas with an egg and then mixed the lot together with some corn flour. These were baked for a bit at 450 and served with Sriracha mayonnaise. 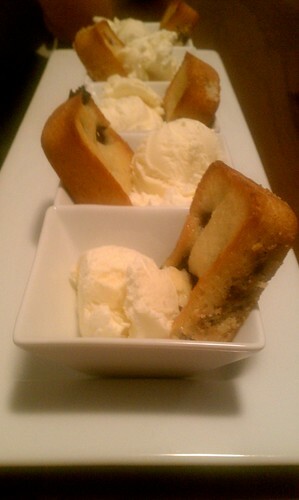 Dessert was a blueberry lime cake with ice cream. July 12, 2011. Dinner Disclosure, Make it again. 2 comments. Last weekend was spent “downa shore” with some family to celebrate Ells-Bells’ (not hear real name, but she has started responding to me when I use it) first birthday. 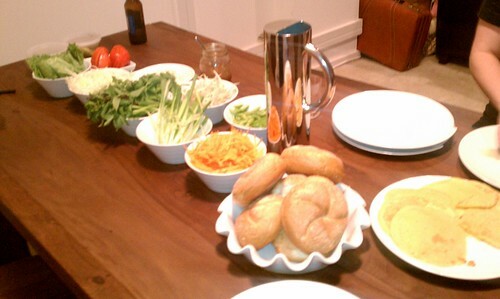 When I arrived on Friday, I jumped into the party-prep. Cousin Carin handed me a recipe and the ingredients for Italian-style baked beans and told me to wing it if we were missing anything. I was a little spooked it was going to turn out horribly and ruin the party, but it was actually quite delicious! Saute one large onion with 5 cloves of garlic in olive oil. If you have an olive oil with herbs, like we did, use that. I think Carin said it was basting oil from Wegman’s. Let the onions get nice and soft, then add in 6 or so cubed Roma tomatoes. Amounts can vary – you want to have a nice distribution of tomatoes to onions. Let the hang out for a little bit, then add in sage and rosemary. If you don’t have one or the other, just substitute an herb of your choosing. I found a mixture of Italian seasoning from the Temecula Olive Oil Company and added that in. Add in some salt and pepper at this point as well. Once the herbs are incorporated, take off the heat and mix in 3 cans of white beans. Taste it at this point to determine if it needs anything else. Put it into a baking dish and bake until it’s a bit bubbly. Mix together panko or regular bread crumbs with olive oil, salt, pepper and any seasonings you like, then put on top of the beans. Return to oven and bake until golden brown and delicious. So much better than throwing a couple of cans of baked beans into a crock pot. July 2, 2011. Make it again. Leave a comment. Last night, I made brownies. Yes, during the terribly oppressively hot weather Philly has been enjoying, I turned on my oven. The brownies are a somewhat surprise for my friend’s birthday today. I say “somewhat” because he begged for brownies like a dehydrated man begs for water. Happy birthday, Jacob. I also meant to make a pie, and even went so far as buying the peaches and, impulsively, the rhubarb. I was even going to make my own pie crust from scratch, because how hard could that be? I was just going to work a full day, come home through the aforementioned gross hotness, and tackle two baking projects, one of which involved a fair amount of skill. Hah. I know. I know. Today at work, I was still thinking about pie. And cooking. But not cooking, because, ugh – hot. Then I saw one of the many “ways to beat the heat” articles online. What made this one special was it suggested making pudding pops. Then I found this recipe online. And, lo, I had a project for tonight. This is an experiment in two ways. First, I’ve never made pudding from scratch before. I’ve watched my mom make it and scoffed at her. I mean, instant pudding is completely delicious. (Side note: I’m slightly pudding obsessed right now. I went to a NJ diner for dinner on Saturday and got pudding for dessert and it was AWESOME. So I was a little nervous about making it from scratch. But how hard could it be? The recipe seemed fairly straight forward. I’m delighted to report that it wasn’t that hard, but it did take a lot longer to cook than Deb’s 15-20 minutes. I used the time to strain a batch of cold-brewed coffee (1 cup ground coffee, 4.5 cups water, let sit overnight) and watch an episode of Barefoot Contessa. The second part of the experiment is the making of the pudding pops. Can it be as easy as freezing pudding? Now I’ve got four mini dishes in the fridge and five potential pudding pops in the freezer. Keep your fingers crossed, folks. This just might revolutionize my life. July 7, 2010. Make it again. Leave a comment. Not the best picture of dinner tonight, but I wanted to get it written down. I’ve decided to add a category for posts where I make something that I know I’d like to make again…that way, I can have a record of the stuff that I’ve made that’s worth revisiting, because it’s fast or good or, rarity of rarities, good AND fast. This morning as I was throwing together lunch, I spotted some olives and provolone leftover from last weekend’s Wegman’s trip. “Mmm, snacks before dinner tonight,” thought I. Then while discussing dinner plans with a coworker, I remembered that I had a good deal of cauliflower left as well. I figured I would just roast it. Then while walking home (IN the rain, SANS umbrella), I thought about trying my hand at aioli. “Yeah,” thought I, “maybe with some smoked paprika!” I was recalling the cauliflower at Zahav, but didn’t want to fry it and also didn’t have any plain yogurt on hand (that was part of lunch today). But while thinking about what else was in the fridge, I remembered that I had some mushrooms too. I pondered throwing them into roast as well, and then that some how morphed into an Asian noodle soup. 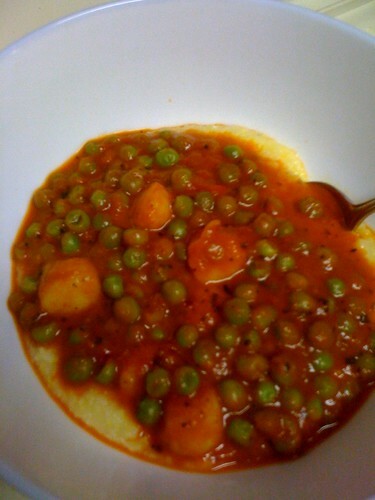 Inspired by this PioneerWoman recipe, scallops and peas in roasted red pepper sauce over polenta. Like I said, it doesn’t look like much. But it was damn tasty. Melt/thaw roasted red peppers and chicken broth. Once melty, puree in a blender. Pour back into the pan, bring it to a high simmer. Add some dried basil. Then hey! How about some red pepper flakes? Oh and salt. Hadn’t added any salt yet, that won’t do. Once the sauce is bubbly, add the scallops and peas and let’m cook til they’re done. At some point, start making the some polenta. Once it’s ready, ladle the sauce over the polenta and squeeze a little lemon on top. October 23, 2009. Make it again. Leave a comment.